Getting into bike racing often means having to negotiate protocols and procedures set in place by die-hard veteran racers, but cyclocross is generally non-serious and one of the most welcoming types of bike racing, especially for beginners. It’s almost time for Cyclocross across the country and here in Portland, it’s already begun. Portland is often mentioned as the hotbed of cylcocross in the US, with 1200+ racers showing up to every weekend race in the fall. Due to the incredible demand, September is a full-on preseason time to brush up at a skills clinic and maybe even race before the main season begins in October. You start in cyclocross by getting tuned up every year, or if you’re new to the sport, you attend a clinic to get used to everything you’ll encounter on a cross course. 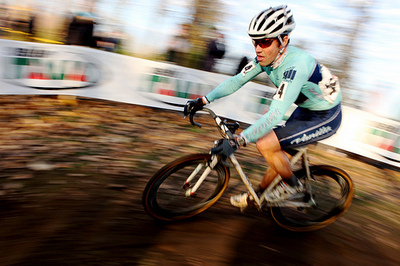 I’ve never attended one of the many cross clinics around Portland, but I’ve heard nothing but great things about them. Depending on the attendance (some clinics attract over 300 people in a single night) you often split into small groups as a Pro/A class rider leads you through a variety of cyclocross drills explaining the best ways to dismount, mount, jump barriers, and take off-camber turns. This year there are several clinics to chose from: the classic Wednesday night Alpenrose clinics run through September, the new Upper Echelon clinics that run through October, and the latest entry to the clinic scene: the PDX School of Cross monday nights featuring a race in the dark (with lighted cones) that follows each clinic. September is generally the pre-season around here, and there are a variety of races to get up to speed. The Thrilla Cross series over in Bend is a great way to get several races in before the main season starts. Pain on the Peak is this weekend and a popular first cross race for many Portland riders (it’s also known for being insanely hot and dusty). Eugene, Oregon’s Psycho Cross Series runs during the early weeks of cross as well as the last weeks of the season and it gets started this weekend. The late September Hood River double-cross weekend is another traditional start to the season for Portland-area racers. Later in the month, Wednesday night Alpenrose night races called “Blind Date at the Dairy” are new this year, and Battle at Barlow rounds out the pre-seaon. Cross Crusade pretty much IS the cyclocross season for Oregon, running from Early October to mid-November with races every Sunday as well as one double-weekend around Halloween (in which almost everyone rides in a costume and you are endlessly heckled if you do not wear a costume). Cross Crusade events are huge with single races often containing well over 100 racers in every category, it can feel at times like that time in college you had to take Intro to Calculus and you sat in a room full of 300 people. Still, the races are fun, the courses are very wide and flat offering plenty of room for passing, and the terrain is varied enough to keep it all interesting. The only problem is that most Cross Crusade races are in the Northernmost part of the state including a couple in southern Washington, making for long drives for non-Portland residents (and even for them some of the races are a 2+ hr drive each way). To remedy that, the Willamette Valley Cross Series is something I’ve been a part of and we have three dates during the main season (all on Saturdays while Cross Crusade runs on Sundays). The Oregon Bike Racing Association (OBRA) Championships take place at the final stop of our series. Down near the California border, they run the Southern Oregon Outlaw Cyclocross Series for racers down in the Medford-Ashland areas as well as riders from Mt. Shasta, CA that don’t want to drive the 6-8hrs to get to Cross Crusade events. The US Gran Prix of Cyclocross Series has been hitting Portland as a stop in its national events for the past few years. This year, Portland hosts the final race in the four race series that features the best cross racers in the country battling it out. A week after the USGP wraps up, Bend, Oregon gets to host the National Championships of Cyclocross. It’ll be an exciting couple weeks in December in Oregon as we find out both who wins a national series title as well as who is crowned the US National Champion (complete with the stars and stripes jersey for next year) for 2009. It’s easy to see why Portland is so big into cyclocross – it seems there is something happening every weekend from late August to mid-December all over the state. Cyclocross isn’t just good off-season training here, for many racers it’s their main focus for the entire year’s schedule. If you ever find yourself in Oregon with a hankering for some cross, keep your eyes on the OBRA cyclocross schedule for 2009. Even if you’ve never raced cross and never will, it makes an amazing spectator sport, as I myself found out when I stumbled across the 2004 USGP race in Portland almost a year before I bought my first road bike and at the time I didn’t even know what cyclocross even was, but I knew after watching it, I wanted to give it a try someday.